The Air Force demonstration aerobatics team, the Thunderbirds, won’t be performing, but AmericaFest will go on. He called AmericaFest “a world class event that strengthens ties with Okinawa while providing fantastic entertainment. Tuesday is reserved for visitors with base access. 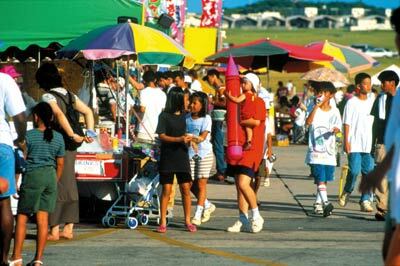 The festivities run noon to 10 p.m.
Wednesday is open to the general public, Okinawawide, beginning at noon and running to 9 p.m.. The fireworks display is scheduled for 8:15 p.m. Wednesday. Parking is available at Yomitan Auxiliary Airfield, with shuttle busses running beginning at noon. Additional shuttle busses will pick up pedestrians outside Kadena Air Base Gate 2. Performances at the AmericaFest include top entertainment with Okinawan style reggae band Ryukyu Lion, the soothing variety sounds of the Pacific Air Force Band, the Classic to Alternative rock beats of Feedback Queen, and Storm Watch from Jamaica. From the Island of Okinawa, the famed Dancehall Reggae Star Mr. Vegas is coming to delight and dazzle on the main stage from 9 to 10 p.m. on Tuesday and from 7 to 8 p.m. on Wednesday. This is the first AmericaFest since the events of Sep. 11, 2001, and only the second in five years. The 2000 event was cancelled amidst security concerns for the G-8 Summit, and the 2002 and 2003 festivals were cancelled as security levels were elevated. Those decisions were met with mixed emotions by Okinawans, who feared the Air Force cancellations would be further proof the island wasn’t safe. An Okinawa City Chamber of Commerce Director, Seikicki Naka, said Japanese were already afraid to visit Okinawa, and the cancellations could “create an image that Okinawa is dangerous.” The Okinawa Prefecture Tourism Promotion Office didn’t agree. Michiko Maeshiro told reporters she didn’t think the cancellations would affect tourism at all. The last AmericaFest drew more than 250,000 visitors across the weekend. The airfield was totally shutdown to allow for the festival, which featured 15 Army, Navy, Air Force and Marine aircraft, as well as others from the Japanese Self Defense Forces. 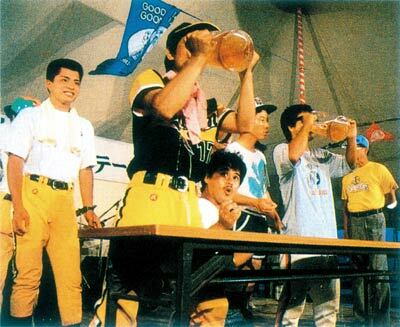 Okinawa City is trying again to get its All Okinawa Eisa Festival and the Orion Beer Festival into high gear. Drowned out by Typhoon Songda last weekend, officials are opening the gates to the Okinawa City Park beginning Friday. A parade will launch the festivities near Goya Crossing and Gate 2 Street at 8pm Friday, with dozens of Eisa groups marching and playing. The beer taps begin flowing Saturday as the Orion Brewery hosts its annual Beer Festival. Center stage is active Saturday and Sunday evenings, with singer Shakari and the band Goma playing Saturday. Look for bands Jeans, Proud 9 and Diamantes with Radius on Sunday. The summer season comes to a crescendo the following week at Okuma, the military’s resort north of Nago. OkumaFest2004 plays Sept. 18 and 19, with live bands, food, glass bottom boat rides, games and prizes. Entertainers slated to perform include Diamantes, D-51, Dengeki Network, Mr. Vegas and David Ralston. Details are available from Army or Navy MWR, Air Force Kadena Services, and Marine Corps Community Services.